Hello and Happy Tuesday! I took a vacation day last Friday to have a long weekend and I seriously thought Monday would NEVER end! lol I'm so glad it did! I should have made my card for the Stamp, Ink, Paper Design Team during my long weekend but of course I waited until Monday night! I really am a last minute kind of gal lately! 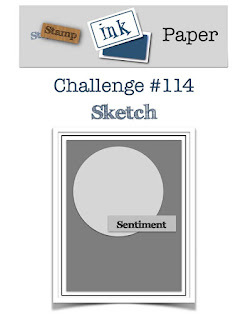 lol This week's Stamp, Ink, Paper challenge is a super fun sketch that really has sooo many possibilities! And believe it or not, I actually stayed very true to the sketch! Hard to believe I know....... but really I did! 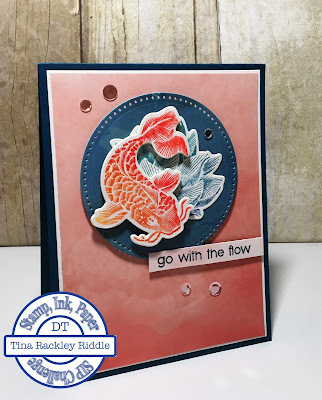 I finally got the opportunity to use a fun new FSJ stamp set called Koi Dreams. Your card is wonderful, Tina! Sooooo pretty.